I couldn't read the full article, I don't have a subscription. But here are some reactions to the public part of the text. "Fast" has many meanings and the quoted text was vague. It might mean very brief, but duration can be determined from acoustic records. It might mean high velocity, but consonants don't exhibit velocity. Moving articulators have velocities, that can be measured, and usually different parts of, say, the tongue show different velocities at the same moment, and a given part of the tongue can show different velocities in different situations. 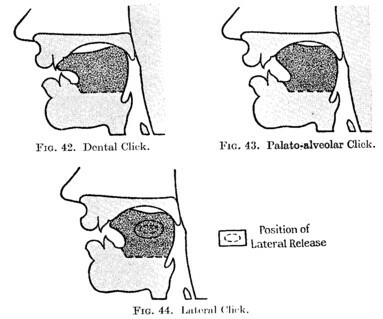 To be meaningful it would be necessary to state which part of which articulator during which phase of a click consonant has such a high velocity to make it "faster" than any component of any other consonant. In any case, I'm not sure you can compute articulator velocities from ultrasonic scans. The surfaces of the articulators are elastic and different fleshpoints move around with respect to each other. You can't see, and track, single fleshpoints with ultrasound or X-rays. That's why people glue markers to articulators, assuming a marker remains faithful to its particular fleshpoint. The Sc. Am. text states ultrasound is one of the only medical scanning devices that can keep up with speech. Let me put some numbers to temporal resolution to show some examples. Traditional motion films and digital video alike consist of sequences of static images. Human vision will fuse 25 image frames/second into a sensation of smooth movement. That sets a lower resolution limit for an impression of keeping up with speech. Phoneme rates can be as high as 20/second, so a temporal resolution of 25 images/sec will give at least one image, maybe two, somewhere during each phoneme, but you won't know where precisely. Frame rates of 48/second for motion films were common 50 years ago, giving 2-4 images per phoneme. Yet I've watched X-ray films made at 48/s that missed entire occlusions. My own X-ray motion films were made at 75 frames/second (3ms snapshots every 13ms), all events are there, and I know precisely where each frame occurred during the speech acoustic record. I'd probably be happier with 100 frames/sec. Whatever the technology, that's how different temporal resolutions manage, or fail, to "keep up with speech". Are the illustrations of vocal tract sections from Westermann and Ward based on radiograms? I doubt it. They look like the illustrations in Daniel Jones's Outline of English Phonetics, i.e. only the grey areas move around, everything else is fixed. I see them as visualizations of what the authors say in words, i.e. they are synonyms for the verbal statements, not evidence for the verbal statements. So we're back to John's point about when do we know we know something. I'm surprised no one was bothered by this, as the Nguni languages (Zulu, Xhosa, etc.) alone have more than 20 million speakers. Clicks are fairly rare, and I'm sure some "rare" languages (whatever that means) have clicks, but that doesn't warrant implying that clicks are only present in dying languages.